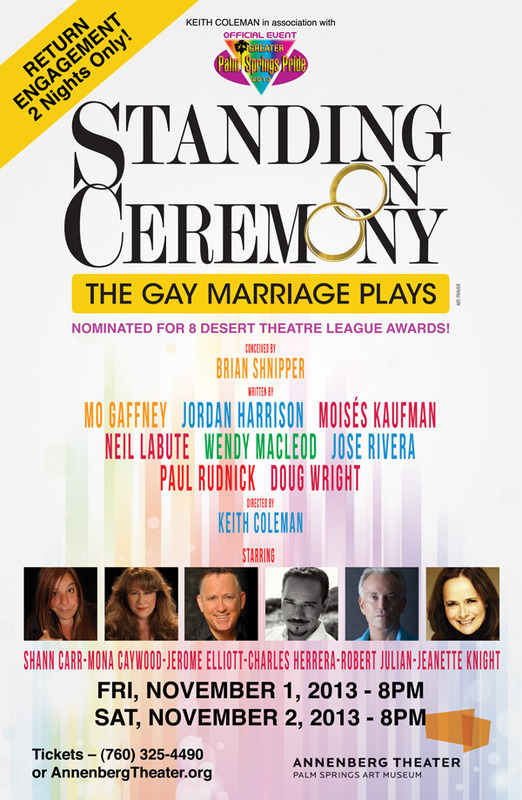 Standing on Ceremony, The Gay Marriage Plays returns to the Annenberg Theater at the Palm Springs Art Museum for two performances only on Friday, November 1 and Saturday, November 2, 2013 at 8:00 PM. The production has received eight Desert Theatre League nominations, including Best Production, Director and all six Performers. The cast features well-known local celebrities including Comedienne Shann Carr, Singer/Actor Mona Caywood, Cabaret star Jerome Elliott, Singer/Actor Charles Herrera, Author/Actor Robert Julian and Actor/Director Jeanette Knight. The plays are under the direction of local producer, Keith Coleman and presented in association with Greater Palm Springs Pride, an official event as part of the annual Palm Springs Pride Weekend. Tickets are available online now at www.AnnenbergTheater.org or at the Annenberg Theatre Box Office in person or by calling 760-325-4490. Ticket prices for either performance are $39 and $29.